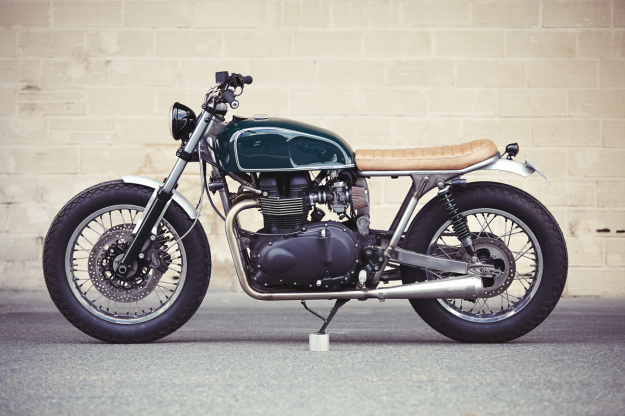 As long as Triumph keep churning out modern classics, builders will be lining up to chop them. 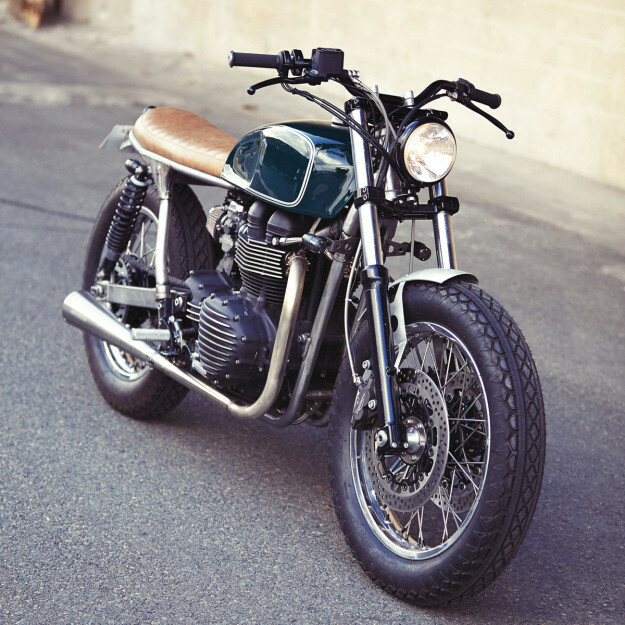 This latest example is a 2007 Bonneville T100—tastefully reworked by the crew at Clutch Custom Motorcycles. 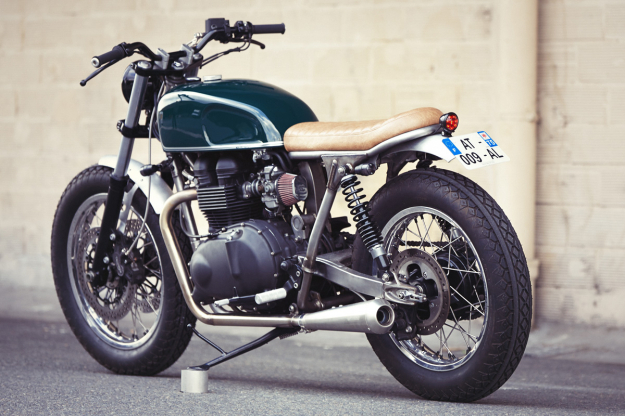 Clutch Custom operates out of Paris’ 12th arrondissement, and if I had to describe their signature style, it would be well-proportioned bikes with excellent lines. Or, as Clutch’s Willie Knoll sums it up, “perfect flow”. 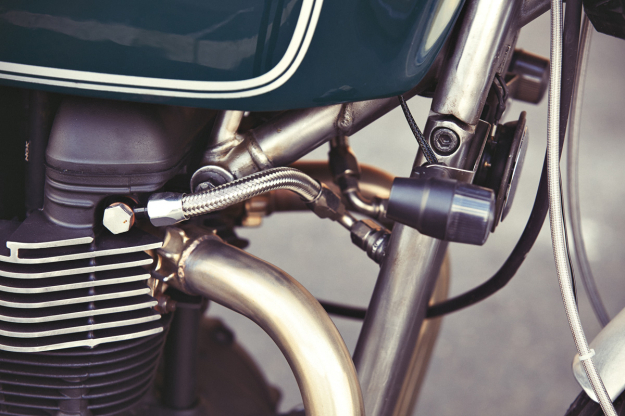 To achieve “perfect flow” on this Bonnie, Clutch started with the frame—shortening and re-working the rear to follow a straighter line from the tank, and to support a custom perch. Willie’s not a fan of the modern Bonnie’s radiator placement, so the lower front part of the frame was rebuilt to eradicate the radiator and run internal oil cooling. Up front are the forks from a Triumph Trophy, attached via a brand new bottom and modified top triple tree. The bike’s been lowered a little under 1” at the rear and just over 1.5” at the front. New Excel rims have been fitted: a 19” front, laced to a Yamaha XS650 hub, and an 18” rear, with the swingarm tweaked to accept the increase in diameter. Both wheels are wrapped in classic Coker Diamond rubber. Clutch had to order in a custom front brake disc—one of the few parts that they didn’t fabricate themselves. 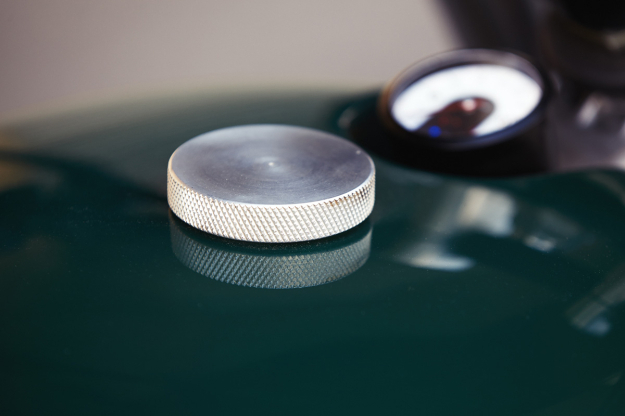 Other hand-crafted pieces include a beautifully machined gas cap, foot pegs and front and rear fenders. More discreet running lights have been fitted, and the entire electrical system now runs on Motogadget components—all tucked away with cleverly hidden brackets. The Bonnie’s motor’s been rebuilt, and capped off with stunning Speed Merchant covers. It now runs with twin K&N filters, custom exhaust headers and Spark silencers. Clutch repainted the entire engine (including the new covers) black, before polishing up the fins. 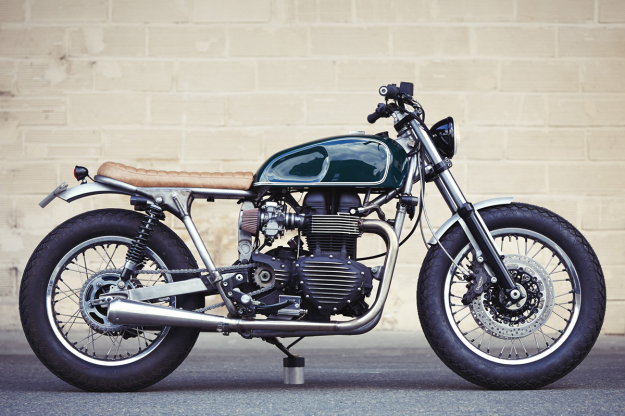 With this being one of the classiest Bonnies I’ve seen in a while, I’d say that Clutch Custom are certainly managing to stick out. 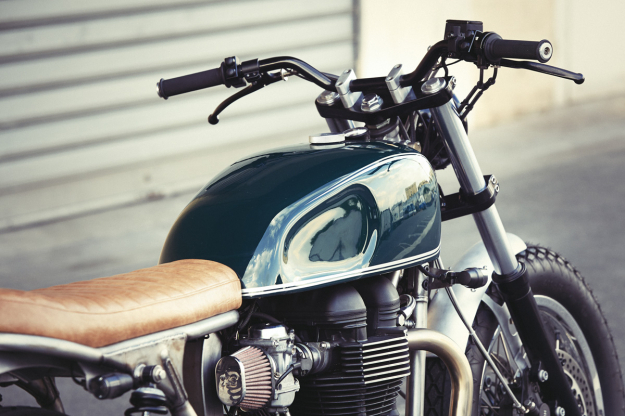 Keep up with Clutch Custom Motorcycles’ work via their website or Facebook page.